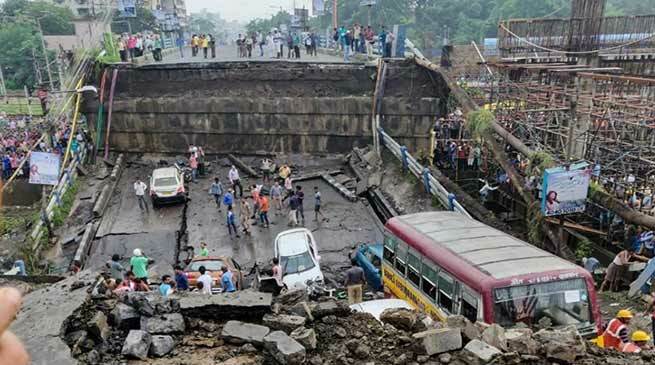 A portion of the crucial Majerhat bridge on Diamond Harbour Road in Kolkata collapsed this afternoon. The incident has claimed one life and has injured 25 people. One minibus, a few cars and number of two-wheelers were damaged as the bridge collapsed. The 40-year-old Majerhat bridge connects south Kolkata to the suburban areas. There was a temporary hut and an office for the labourers of the Metro Railways under the portion of the bridge that caved in. Emergency services have been pressed after the flyover collapsed this afternoon. The National Disaster Response Force has deployed three teams to the spot where the Majerhat bridge collapsed in south Kolkata. Chief Minister Mamata Banerjee who is in Darjeeling right now will soon return to Kolkata. “We are very worried. We are receiving information from the rescue team on ground. We want to go back as soon as possible,” Mamata said. CM Mamata Banerjee has said that her top priority is relief and rescue. “Our team is focused on relief and rescue work. Rest of the investigation will be done later,” Mamata said. “The bridge deserved better maintenance. There was a report on a pit here for quite some time, I don’t know whether the PWD noted it. The PWD and Railway administration had the responsibility to maintain it. The matter requires investigation,” Tripathi told reporters.